This is a *late* shout-out to one of my alma maters, the University of Arizona (U of A) in Tucson. 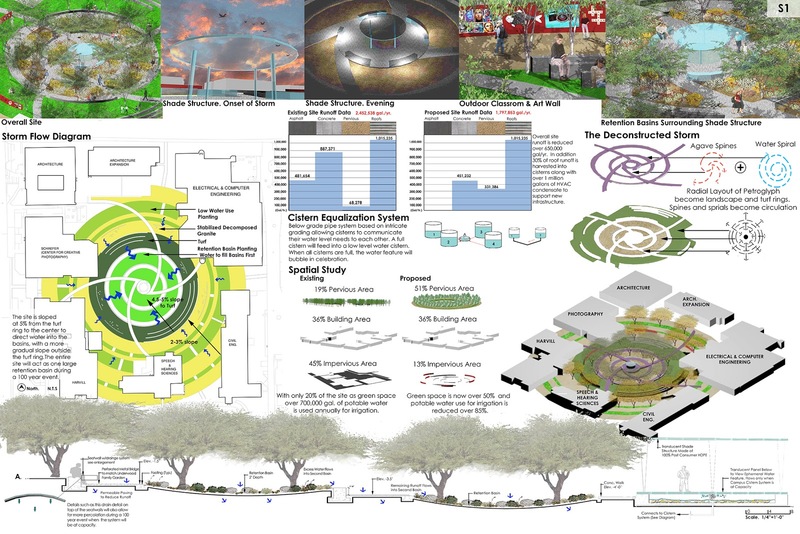 Congratulations to Rayka Robrecht and Micaela Machado, both landscape architecture graduate students at U of A - they designed one of the winning stormwater harvesting systems in the United States Environmental Protection Agency (USEPA) Campus RainWorks Challenge. They achieved second place for large institutions in the nationwide competition. The system, shown in the image below, was designed to re-use stormwater, roof drain water from surrounding building roofs, and air-conditioning condensate water. 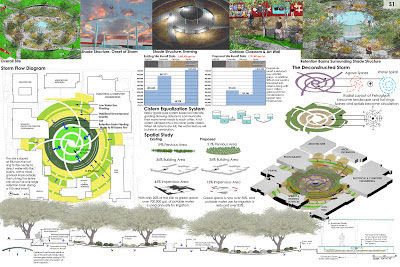 The second-place-winning design from U of A for large institutions in the USEPA Campus RainWorks challenge. 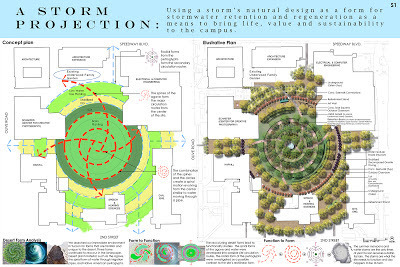 Stormwater collected in this green infrastructure design is collected in underground cisterns. The spiral shape is supposed to evoke an agave, petroglyphs, or the monsoon storm patterns in Tucson. The water is funneled to the center of the basin. The designers anticipate that the design, if implemented, could save U of A almost 2 millions gallons of water each year. The spiffiest feature is at the center of the design - a view window that shows the collected water in the cisterns or chambers. If U of A really decides to modify the existing parking lot into green infrastructure like what was proposed by the designers in the Campus RainWorks Challenge, it would be a very pleasant place for students and faculty/staff to enjoy the tactile benefits of sustainability. "The University of Arizona team�s design plan centers on the redevelopment of a 70,000-square-foot parking lot located within a cluster of academic buildings. 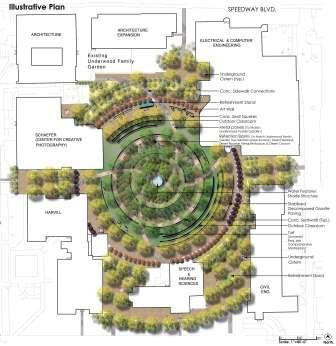 The design will replace the parking lot with a campus common area featuring two rings of retention basins to infiltrate stormwater runoff, five underground cisterns to harvest runoff and HVAC condensate from the adjacent buildings, and a translucent shade structure with an ephemeral water feature. Water collected in the underground cisterns is used to irrigate the landscape, reducing potable water use from 700,000 to 90,000 gallons/year." The Industrious Hygienist is a HUGE fan of practical methods of implementing sustainability. Well done, Rayka, Micaela, and faculty advisor Ron Stoltz.